Some sisters know how to have all the fun! 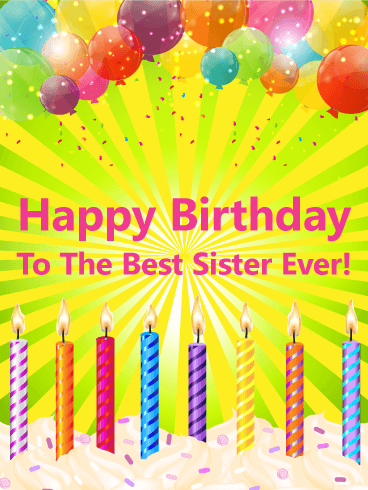 If that's your sister, this is the colorful birthday card for you! 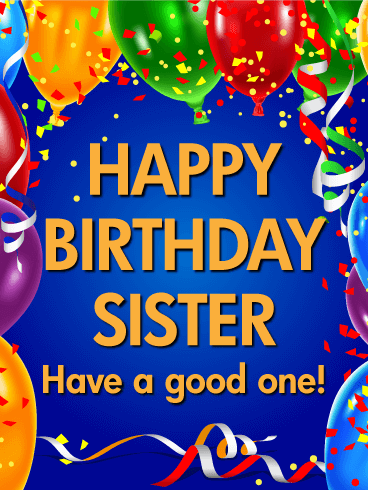 Send your wonderful sister a bright and bold birthday greeting card with a fun message today. 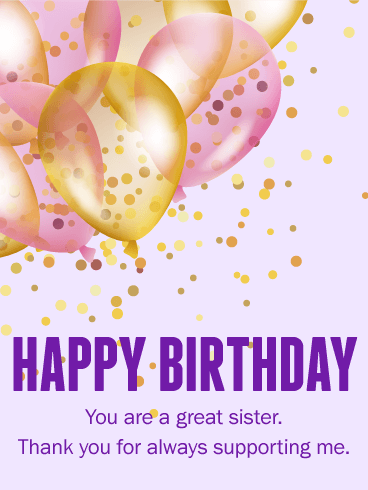 The shimmering pink and purple balloons are undeniably festive and this card is the perfect way to celebrate your sister's unique life and vibrant personality. 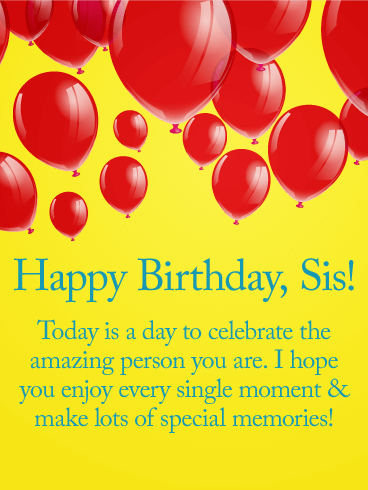 Your sis will be floating on air when she sees this balloon-filled birthday card from you! 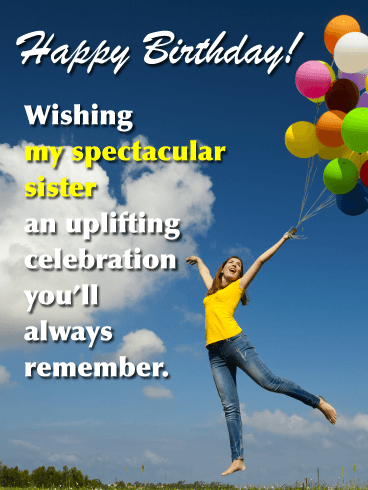 The message holds your best wishes for a fun & festive celebration that will have your sis smiling from start to finish, while she makes wonderful new memories. 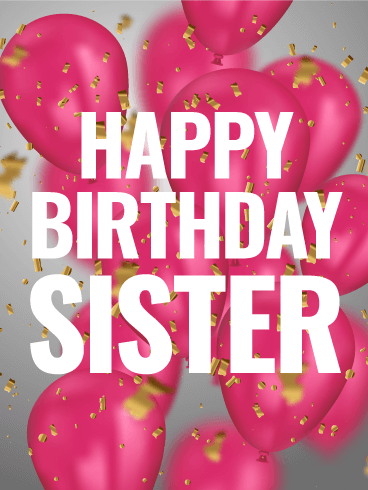 Whether you're near or far this year, let your amazing sis know you're thinking of her and hoping she enjoys every single moment of her special day. 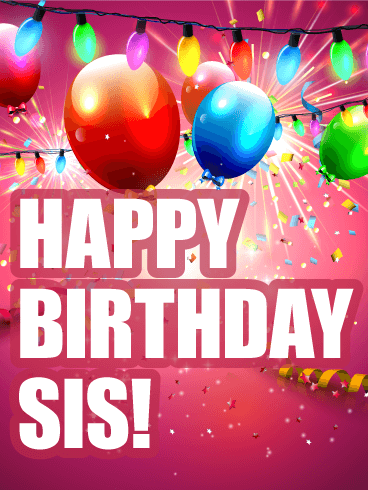 Sis! Happy Birthday. 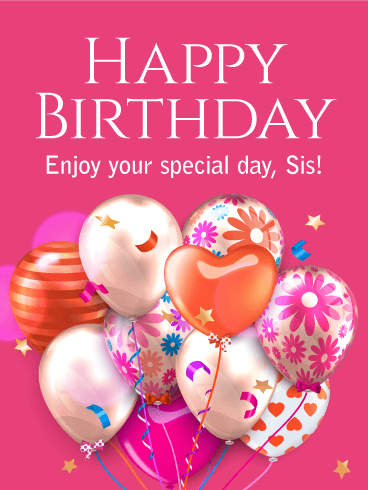 Your sister's birthday is here again, a wonderful opportunity to reach out in a special way. 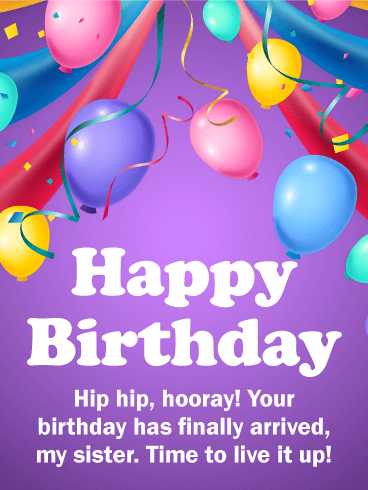 This whimsical birthday card brings your best wishes for a happy birthday, complete with festive and colorful pink balloons and gold confetti, perfect for getting the party started. Even if you can't be there to celebrate with her, this sweet greeting will let her know you're thinking of her on her special day! 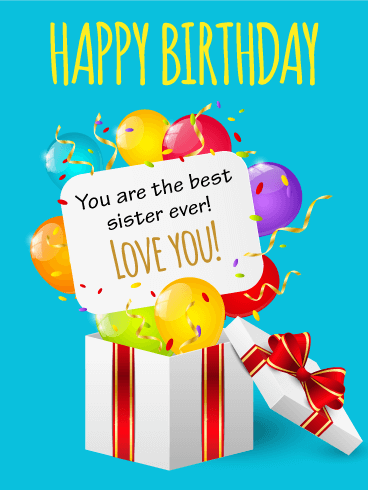 This bright, colorful birthday card is sure to make your sister's eyes light up with delight as she celebrates her birthday! 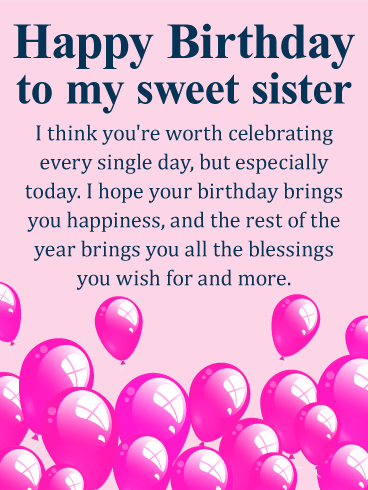 Cheerful balloons float above your sweet words, letting her know you think she's the absolute best and how much you love being her sister and her friend. 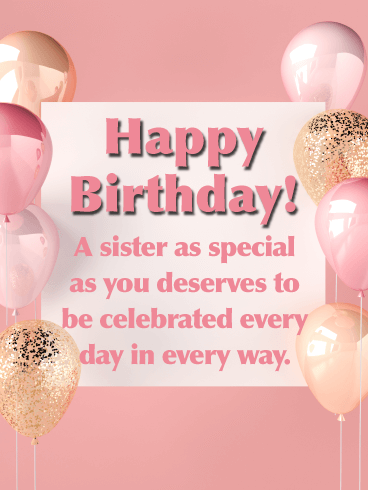 Whether you see each other every day, or are celebrating her from miles away, this thoughtful birthday card is sure to touch her heart. 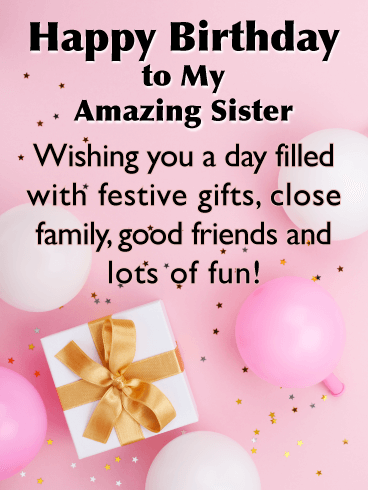 It's your sisters birthday, so send her this festive and fun birthday card and let her know just how much you love her and are wishing her the most happiest of birthdays a sister could ever wish for! 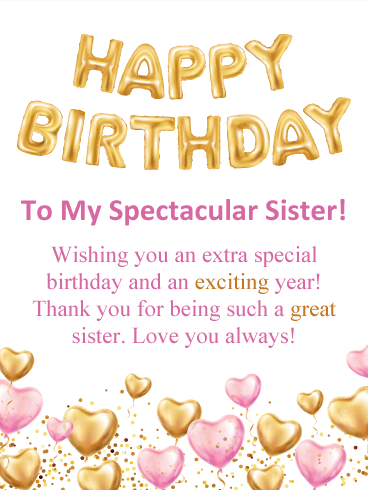 A birthday just isn't a birthday without balloons and your sister will surely appreciate this birthday card with colorful balloons floating out of a birthday present along with star confetti! 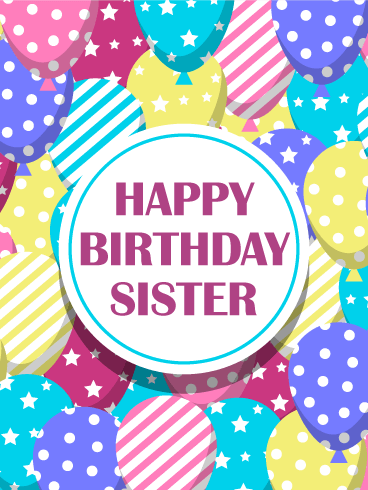 Bright, and cheery, this sister birthday card is just the thing for wishing your sister a Happy Birthday! Paper-pieced balloons are released to the sky. They carry wishes for a great year ahead. 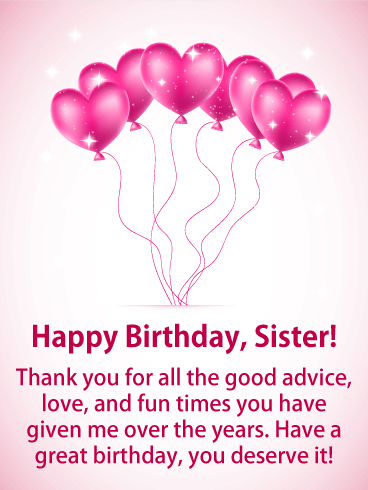 This artistic birthday card is just for sisters and a colorful way to wish yours a happy birthday. 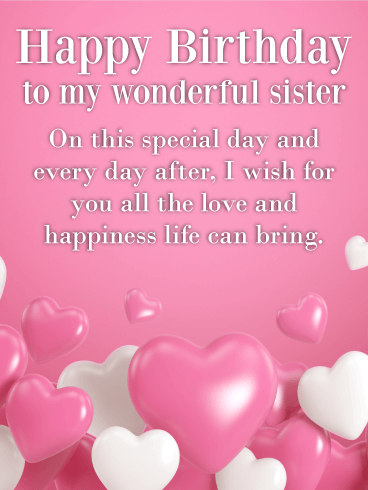 A sister is one of life's precious gifts. 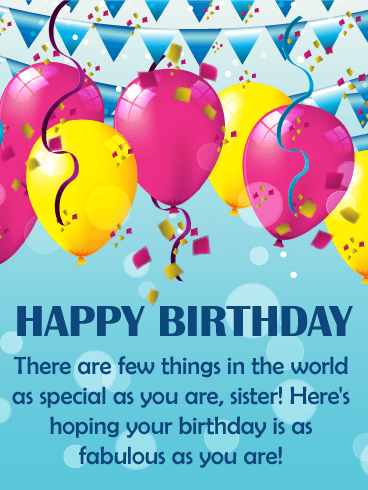 Make your sister feel loved on her birthday and send a sincere and attractive birthday card today. This birthday card is festive and unique. We know she'll love it. 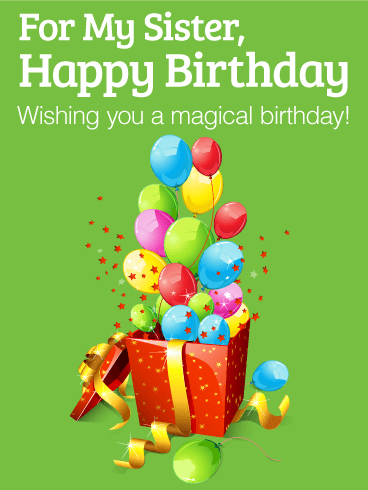 If you don't do sappy, this is the card for you! You and your sister don't mince words and you speak straight and honest with each other. 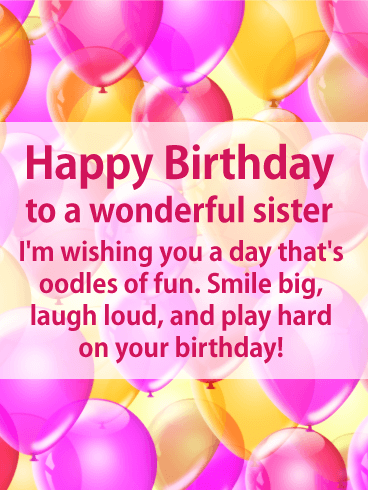 She'll appreciate this festive birthday card and know you are thinking of her. 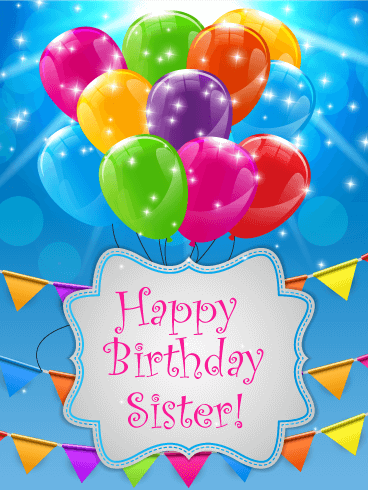 Wish your sister a happy birthday with this colorful, balloon-filled birthday card. You don't have to make a mess of her house with real confetti, just send it through email! It's the thought that counts. Shiny, party balloons can't be beat! 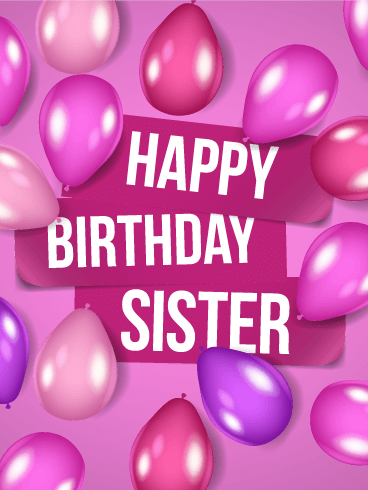 This hot pink birthday card for your sister is a fantastic way to say "Happy Birthday!" 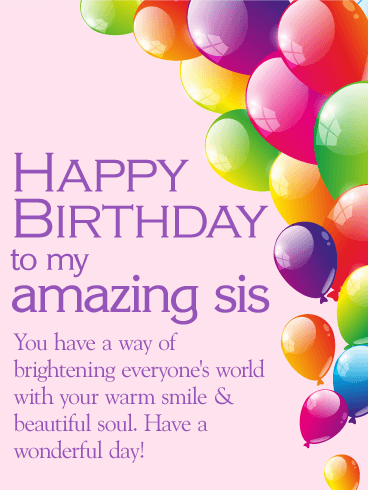 to a sister who really shines. Flower power balloons, heart balloons, and striped balloons, this birthday card is for a sister who loves a celebration. 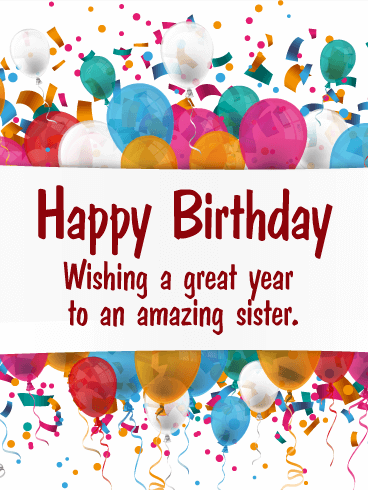 It's easy to wish your sister a great birthday-just send a special birthday card and she's sure to smile! 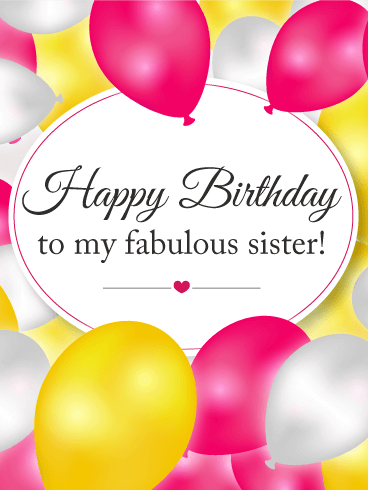 A sharp and lively birthday card for your favorite sister will add to her special day. 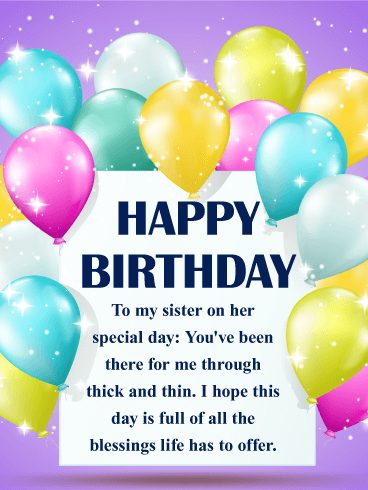 Send her warm wishes for a great day. 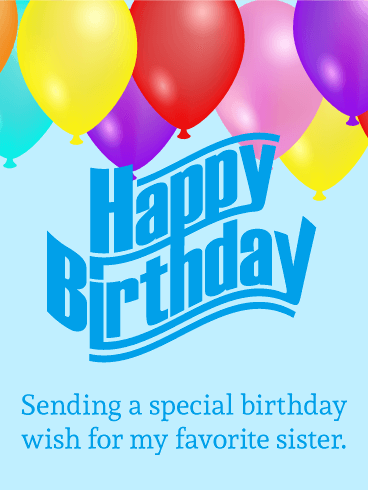 This robin egg blue birthday card has a great birthday font and attractive satin balloons floating at the top. 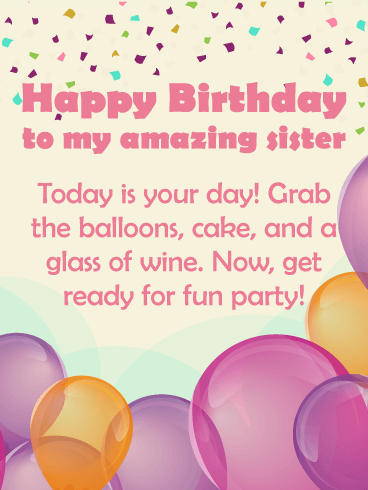 It's fun and simple-just right for your terrific sis. 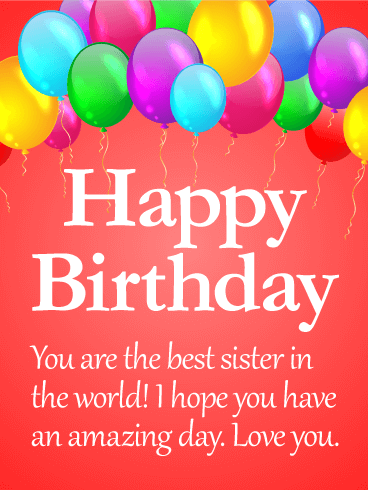 Wish your sister a happy birthday and send this awesome birthday card now.